Using multimodal artefacts created by students on the MSc in Digital Education, alongside my own experiences as a tutor, I argued that we should pay greater attention to the potential of multimodal feedback around assessment, for instance as a way of demonstrating the representational possibilities and academic validity of assignments crafted in multimodal form. Some of the ideas I talked about featured in my recent article in Multimodal Technologies and Interaction where I argued that multimodally-rich dialogue between teacher and learner can embolden students to be simultaneously adventurous, creative and scholarly in the assessment setting. Considering the co-constituting nature of assessment and feedback it is surprising that there has been little critical interest in the relationship between multimodality and feedback, although work by Hung (2016) highlighted the potentialities of video feedback amongst students, while Campbell & Feldman (2017) are among those who have suggested that digital multimodal feedback might be an efficient way of engaging with large cohorts of learners. On previous occasions when I have had the opportunity to present my ideas to colleagues researching multimodality at University College London and University of Leeds I have come away with new ideas and ways of thinking about the subject. Today was no different. In the discussion that followed my presentation we talked about the way that multimodality often becomes confused with multimediality, and also what is potentially lost around what I'm going to call 'knowledge apprenticeship', when digital technologies are seen as a short cut to the acquisition of information and the production of multimodal artefacts. Campbell, B.S. ; Feldmann, A. The power of multimodal feedback. J. Curric. Teach. Learn. Leadersh. Educ. 2017, 2, 1. Hung, S.T.A. Enhancing feedback provision through multimodal video technology. Comput. Educ. 2016, 98, 90–101. Today sees the first Learning and Teaching Conference here at Edinburgh University, which takes as its theme, 'inspiring learning'. For my part, I will be presenting a poster, Exit the classroom! Mobile Learning & Teaching, alongside my colleague from the Centre for Research in Digital Education, Michael Gallagher. The poster follows a path across six different excursions or exercises where, along with our colleague Jeremy Knox, we have explored the possibilities of mobile learning and methodology. Beginning with a two-day workshop that Michael delivered in Helsinki in 2013, through events in London, Amsterdam, Edinburgh and Bremen, our poster makes the case for taking teaching and learning beyond the boundaries of classroom and campus. The final and most recent activity in this series was a fully online event delivered earlier this year within the University’s Festival of Creative Learning, where our group brought together students, teachers, researchers and learning technologists from across three continents and a range of academic disciplines. In each case our excursion (or that undertaken by participants) was digitally-mediated as we drew on the capabilities of smartphones, instant messaging services and other networked content or applications. Having previously spoken and written about these exercises (including an article for Qualitative Research that should be available any time now), on this occasion I wanted to share our work in visual form. Although I have talked and written about multimodal assessment before, I am looking forward to arguing for greater attention towards the multimodal character of feedback and dialogue between student and tutor. When the teacher has an important role in encouraging students to recognise the scholarly validity of the digital multimodal form (Lea & Jones 2011), this can be achieved, I will argue, by presenting our comments, guidance or encouragement in corresponding form. Conversely, if our feedback is primarily conveyed through language (whether spoken or written) we implicitly defer to the power of words, while 'othering' alternative approaches as experimental or risky (and thereby less attractive in the high-stakes summative assessment setting). Considering the intimate link between assessment and feedback, it is surprising that research investigating the relationship between multimodality and feedback is scarce (useful exceptions being work by Mathisen (2012) and Philips et al. (2016)). Plenty has been written about the possibilities and challenges of multimodal assessment however much less has been said about the way that, by taking a multimodal approach within their feedback, teachers can embolden and inspire students towards the representation of knowledge in ways that are simultaneously scholarly and in-tune with our increasingly digital and visually-mediated world. Thank you to Kathryn James and colleagues at Lancaster University for inviting me to speak at today's conference. Phillips, M; Henderson M.; Ryan, T. Multimodal feedback is not always clearer, more useful or satisfying. In Show Me The Learning. Proceedings of ASCILITE 2016, Adelaide, Australia, 28-30 November 2016. S. Barker; S. Dawson; A. Pardo; C; Colvin (Eds.) pp. 514-522. During our recent event, The Mobile Campus: Imagining The Future of Distributed and Digital Education at The University of Edinburgh, Michael Gallagher and I invited our group of 24 students, researchers, learning technologists and lecturers to simultaneously take a photograph of their surroundings. Through this elicitation of images we hoped to get a sense of the different types of 'learning spaces' being occupied across the group, which spanned several campuses and continents. 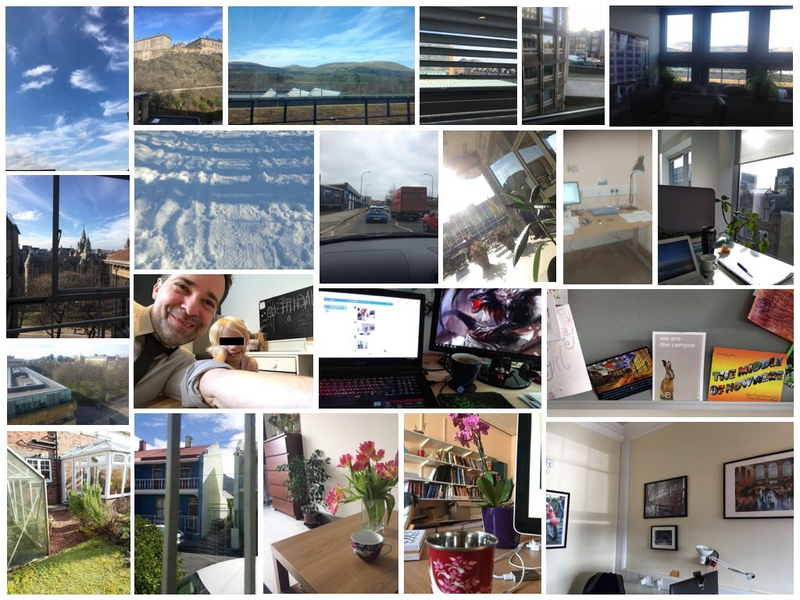 The images shown here could be analysed and then interpreted in a range of ways, however to start with I have attempted to group them under some broad themes: nature; institution; office; home; transit. Some of the photographs transcend these categories. It would also be easy to extend the number of themes. Although the Mobile Campus event didn't set out to generate research data, it would still be interesting to subject the photographs to some kind of visual analysis. Thinking for instance about Gillian Rose's nine methods of visual analysis (2011), perhaps content analysis or a form of anthropological analysis might enable us to ask what the photographs tell us about the ways that the university is performed across a range of spaces and settings? Another line of inquiry would be to consider how the presence of overtly domestic spaces contrasts with the ways that online education is often (visually) portrayed as overtly sophisticated, clinical and high-tech. Looking across the images, plants outnumber computers while there is an even balance of 'homely' and 'officey' spaces. The snapshots offer an interesting glimpse into the different ways that the campus is performed and how teachers and learners engage with the university. Without making any claim to generalisability based upon images from a single event, it is tempting to consider whether this approach might help us to think about pedagogy and the nature of the university itself, as education becomes increasingly mobile and dispersed. ​Rose G (2012) Visual methodologies: An Introduction to Researching with Visual Materials (3rd Edition). London: Sage. Would a greater attention to multimodality make assessment richer? Thinking about affordances around multimodality, can we think about the types of meaning-making that a particular learning context supports? Are there instances where a greater attention to multimodality within assessment will support greater coherence between content and form? Does multimodality provide us with a helpful way of thinking around threshold concepts? What do we know about the way that the curriculum (and the hidden curriculum) prepares students for the employment market and what role can multimodality play a role in supporting this? In considering whether multimodality can feature more heavily within assessment and feedback, we need to remain alert to the purpose of the assessment exercise and the course itself. Do we need to rethink existing assessment criteria in order to match the preparation of multimodal assignments? What ‘chunks of knowledge’ should be assessed multimodality (compared to more conventionally through language) and how should we go about deciding and then executing this? Can multimodal assessment bring more enjoyment to the task of marking, compared to written essays? How granular do assessment criteria need to be in order to evaluate performance? Does attention to multimodality bring the need to individually pay attention to a greater array of meaning-making resources and if so, how complex will assessment become? Taking the example of an oral presentation/examination, are there ways that we could better attend to the ways that non-verbal modes such as gesture and attire contribute towards the communication of meaning? How accurately can multimodal assessment reflect a student’s knowledge and understanding of what matters (in the context of the course) and how can we be sure that we are assessing them correctly? When a student’s time is precious, and multimodal assessment approaches to assessment might take longer than a conventional entirely language-based approach, how much effort can we expect students to put into this? In an examination setting, will there realistically be enough time for a student to produce a multimodal assignment compared to a more conventional piece of written work? What are the time implications for us as tutors: will marking take longer than it currently does when we are already busy? Does a greater attention to multimodality within assessment enable us to better support students with additional support needs? Can multimodality contribute towards a more level field in this respect? Do students want there to be a greater emphasis on multimodality within assessment? What do we know about whether they would support such a move? What are the implications of giving students greater freedom to select the representational form of the work they submit for assessment (for instance through the selection and configuration of modes), assuming we choose to give them scope to do this? If multimodal assessment (and wider pedagogy) is seen to be an effective way of providing graduates with the qualities they need beyond the end of a degree, how do we go about predicting how the job market and society more broadly might change what is required over time? Although many of the suggestions would apply to assessment and feedback practices across the disciplines, the centrality of language within the group's teaching meant that the workshop raised ideas that I hadn't encountered before. This provides a helpful reminder that the possibilities of multimodal assessment, and the potential barriers to its use, can vary across different learning contexts. Thank you to Chiara La Sala from the Leeds Centre for Excellence in Language Teaching for the invitation to contribute to Friday's event. Thanks Also to Martin Thomas and Elisabetti Adami who took time out to meet and explore ideas with me. 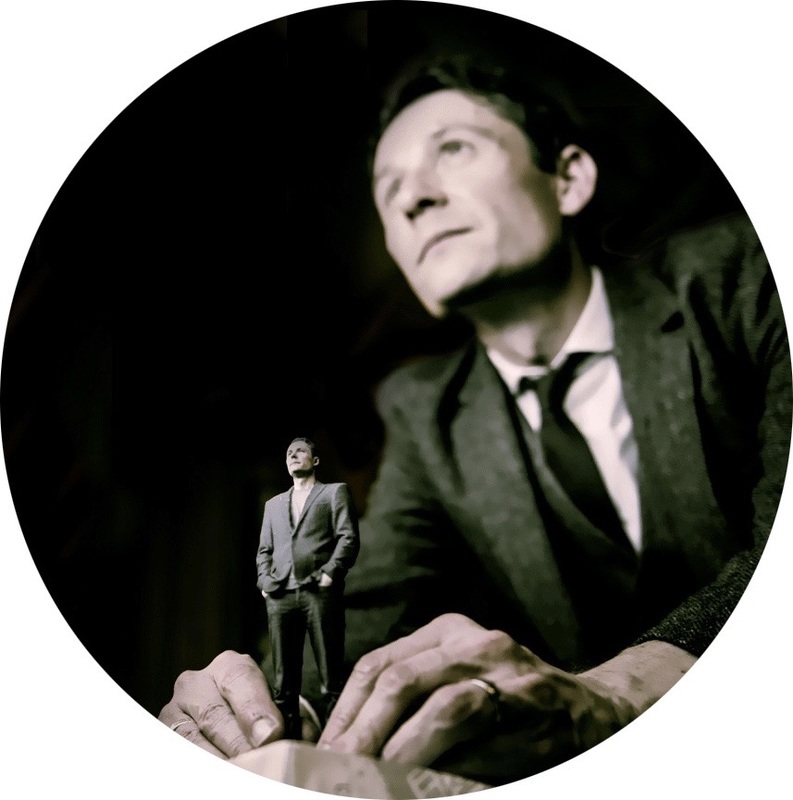 Edinburgh University’s Festival of Creative Learning sets out to explore innovative, imaginative and collaborative approaches to teaching. The focus of the Festival is a concerted and creative week of experimental learning activities between 19 and 23 February 2018, supported by pop-up events across the year. My contribution to the Festival, alongside my colleague Michael Gallagher, will comprise a series of provocations delivered via mobile messaging on what the future of distributed (and digital) education will be for the University. We sketched out the idea for this event in September as we orchestrated a digitally-affected excursion through Bremen. Working in groups, conference delegates navigated their way through the city - and through a series of critical and physical prompts - mediated via their smartphones. Looking forward to the Festival of Creative Learning in February, we are re-thinking distance and location as we look to broaden our activity from a single city-centre to instead encompass participation across different continents. Alongside students and staff from Easter Bush, King’s Buildings and the Central Campus of the University, our event will aim to attract participants from much further afield. One of the arguments that Michael and I will make through our distributed activity is that within an increasingly networked world, mobile technologies can dissolve classroom walls and campus boundaries, as students and tutors in different locations are able to simultaneously and affectively participate in learning events. 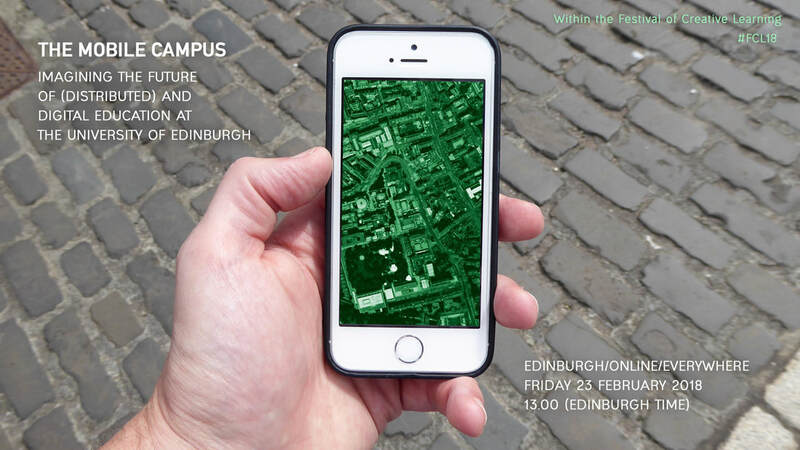 For the duration of an hour, students and staff in Edinburgh and elsewhere will simultaneously engage in conversation and activities, via their mobile devices, that encourage reflection on the future of education within increasingly digital environments. If my use of ‘Edinburgh and elsewhere’ would seem to de-privilege those students who engage with the university at a distance, this is simply because Michael and I have yet to spread the word about our event and therefore do not know where participants will be contributing from. One of most important features of our activity will be to challenge the distinction between ‘campus students’ and ‘distance students’ and the corresponding ‘othering’ of education that takes place beyond the bricks and mortar of the university campus, something that Michael and I explored with our colleague Sian Bayne in our work around the social topologies of distance students. Our event for Friday 23 February 2018 at 13.00 (Edinburgh time). If you are interested in participating or learning more about what we have in mind, please get in touch with Michael who will be glad to hear from you.